Lance McCullers made his MLB Debut Monday night after he got promoted from AA to AAA to the Majors in a 24 hour period. 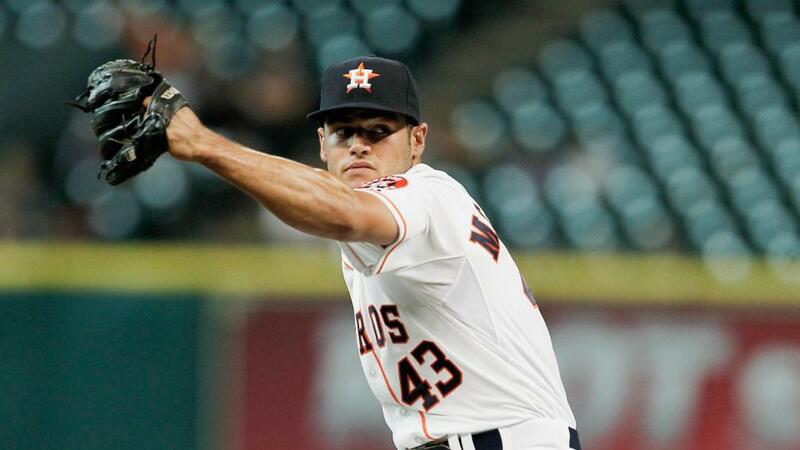 Facing off against the Oakland Athletics, McCullers wasted no time picking up his first major league strike out. Sporting batman themed spikes, he quickly got two outs of the first inning and then faced off against Billy Butler. On a 2-2 count in the sixth pitch of the at bat he struck him out swinging for the first of his five strikeouts. In his debut, McCullers would go on to pitch 4 2/3 innings but was removed after 93 pitches. McCullers only allowed one and struck out five while walking three. The Astros bats could not muster much offense against Drew Pomeranz and the A’s bullpen as they fell in defeat 2-1. 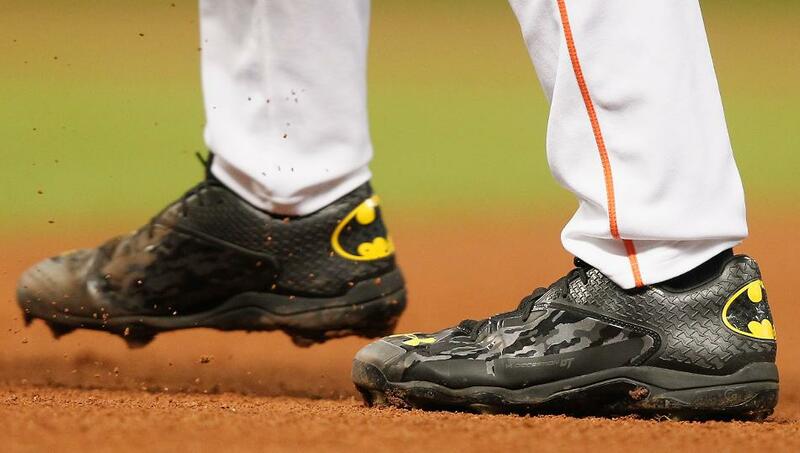 McCullers will have to hang up the batman cleats at least for now as MLB has issued a warning to the young pitcher that if he wears them again he could potentially earn a fine for a uniform violation. Something tells me we still may see batman return in the future. After an impressive start to the 2015 season, the Houston Astros promoted pitcher Lance McCullers to the Fresno Grizzles at AAA level. McCullers, 21, has gone 3-1 with a 0.62 ERA in six games (four starts) while in Double-A. In 29 innings of work he allowed just two earned runs and only 15 hits. In those 29 innings he struck out an impressive 43 batters while only walking 11. The right hander has always featured a strong mid 90’s fastball and a crisp curve ball. Since being selected at the end of the 1st round of the 2012 draft, McCullers has refined his change-up giving him three solid offerings. While some around baseball see McCullers eventually moving to the back-end of the bullpen, the Astros believe he will be a successful starter once reaching the major leagues. McCullers looks to join the Fresno rotation in the coming days. The Chicago Cubs announced today the promotion of outfielder Billy McKinney to Double-A. McKinney had been on fire with the Myrtle Beach Pelicans in the Carolina League hitting .394 over his last ten games. In 103 at bats McKinney has 11 extra base hits including four home runs. McKinney has shown a consistent eye at the plate walking 17 times while only striking out 13. McKinney will bring his team first approach to Tennessee where he will do whatever it takes to help the Smokies win. “I try to do whatever I can to help my team win, If that means giving myself up i’ll do so. I just want to help the team get runs on the board and ultimately I want us to get the W at the end of the night” Mckinney said when we caught up with him while with Myrtle Beach. In his Double-A debut McKinney picked up two doubles and drove in a run in his four at bats. Tennessee went on to win the game over the Montgomery Biscuits 8-1. The Colorado Rockies acquired Tyler Ybarra shortly before the 2015 baseball season got underway. The Rockies assigned Ybarra to their AA affiliate, the New Britain Rock Cats to start the 2015 season. This is Ybarra’s second full season at the AA level and so far he is off to a great start. In seven appearances over eight innings of work, Ybarra is averaging a strikeout an inning while limiting batters to an average of just .179 against him. While he has walked 8 batters he has kept the opposing base runners from scoring allowing only one earned run for an ERA of just 1.08. The Rock Cats have used Ybarra in save situations and he has picked up saves in all three of his save opportunities. Like Ybarra, The Baltimore Orioles acquired Cody Wheeler via free agency just as the season began. The Arizona Diamondbacks surprisingly released Wheeler just days before spring training was set to come to an end. The left hander was just coming off a 2014 campaign in at the AA level which he only allowed one earned run over 22.1 innings and 20 appearances. The Orioles gave him an opportunity in 2015 and he has mostly pitched in the back of their bullpen since joining the Frederick Keys. With the Keys, Wheeler has appeared in nine games and had his ERA at 1.74 until his most recent outing where the Potomac Nationals touched him up for two runs in two innings of work. Wheeler has picked up two wins out of the bullpen and has also closed the door picking up a save on three different occasions. Seth Frankoff started the 2015 season back at the AA level after working his way up to AAA to finish the 2014 season. Frankoff was lights out as a member of the Midland Bullpen to start the season. Working in seven games, Frankoff allowed just one earned run which came via the long ball. Frankoff held AA batters to a .194 batting average and struck out 13 hitters in his 10 innings of work. The A’s quickly promoted Frankoff to the Nashville Sounds, their new AAA affiliate to start the month of May. Since joining the Sounds, Frankoff has appeared in an additional four appearances and after allowing two quick runs in his first appearance has held the opponents off the scoreboard. His ERA currently sits at 3.18 at the AAA level but opponents are only hitting .158 against him. The Astros promoted Jordan Jankowski to start the 2015 season to the Fresno Grizzlies, their AAA affiliate. Jankowski has appeared strictly out of the bullpen in 2015 after splitting time between the rotation and the bullpen in previous seasons. The Grizzlies has relied heavily on Jankowski early on in the season and he has earned three victories in 13 appearances. In his 16 innings of work he has struck out 18 while walking 12 batters. He has not allowed a home run all season long in what is considered a very hitter friendly league. The Cardinals signed Marcus Hatley in the off-season, Hatley had been in the Chicago Cubs organization since they signed him in 2006. Now in his second full season at the AAA level, the Honolulu native has been making the most of his opportunities with the Memphis Redbirds. In 11 games, Hatley has picked 15.1 innings striking out 14 while walking only four. He has an impressive WHIP of just 1.04 and has picked up one win and one save to this point in the season. In his most recent outing against Colorado Springs, Hatley racked up four strikeout in two innings of work to pick up the win in relief for the Redbirds. Josh Osich started 2015 back with the Richmond Flying Squirrels, the San Francisco Giants AA affiliate. The Flying Squirrels has relied on Osich to slam the door on opponents this season. The Squirrels unfortunately went on 15 game losing streak from April 15th to May 3rd that has limited his chances for a save. Osich has picked up saves in five of the squirrels nine victories. In 14.1 innings he has struck out 11 and only walked four batters. Opponents are just hitting .220 against him and a WHIP of 1.05 limiting base runners in his innings of work. On May 2nd, Blake Swihart made his major league debut after being recalled to replace the Red Sox starting catcher Ryan Hanningan. The Red Sox lost Hannigan when he broke his knuckle on his right hand. The injury required surgery for Hannigan. In his major league debut, Swihart picked up his first big league hit in the 5th inning off New York Yankee pitcher Nathan Eovaldi. In the 7th inning, Swihart would face Eovaldi again and draw a walk. Mookie Betts would follow up driving a double to left-center field and Swihart would come around to score his first run of his career. On May 6th Swihart delivered a double of his own to left-center field off of Tampa Bay Rays starter Alex Colome which drove in Xander Bogaerts to pick up his first RBI of his career. Swihart will have many more first and many chances throughout the 2015 season to solidify himself as the catcher for many years to come in Boston. Remember to like us on Chasing MLB Dreams on Facebook and follow us on@CTD_Sypien for more information, posts and updates. Great read as always Scott. Love seeing how all the guys are doing. Really appreciate the updates on Cody as he is transitioning with the Orioles farm club. Great Save #4 for him tonight. Keep up the good work.